The Lander, also known as the Lunar Module (LM), was a two-stage craft built to separate from the Apollo Command and Service Module, and then travel to and from the moon’s surface. It first landed on the moon on 20 July 1969. Generally the descent stage was left on the moon, while the ascent stage crashed into the moon’s surface once the astronauts returned to the Command Module. Each of the 15 Apollo LMs had unique names. The Apollo 11 LM was named the Eagle, which explains why Neil Armstrong stated that “the Eagle has landed” when it touched down. The Lander had three different types of antenna: VHF (for communication), S-band steerable (to facilitate control of the Lander) and rendezvous radar (to facilitate rendezvous between the Lander and the Command Module). The crew compartment was a pressurised environment that supported two astronauts in about 6.65 square metres. 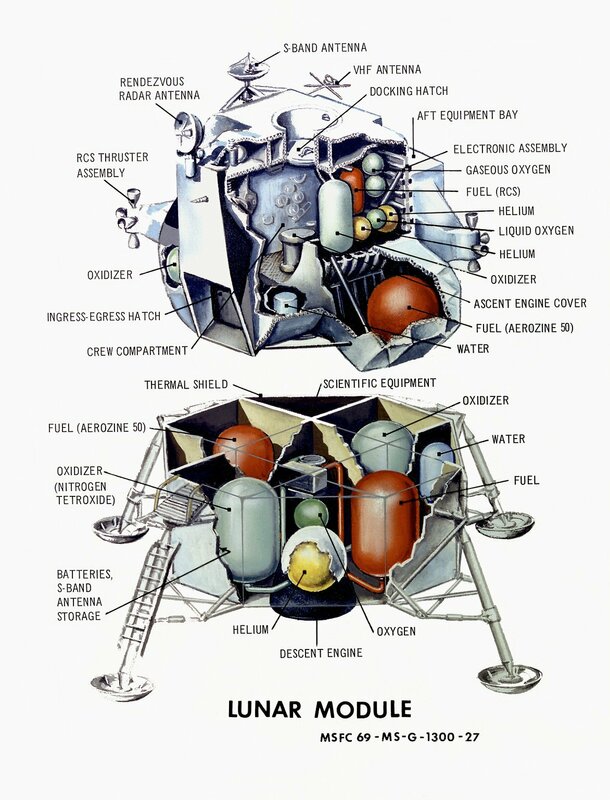 The ascent stage of the Lander contained the crew cabin, navigation system, life support, thermal control system and the capability to return itself to the Apollo Command Module in lunar orbit. The descent stage contained the fuel to land on the moon, landing gear, a ladder to descent to the surface and materials for experiments and sample collection on the moon. The Lander was powered by a rocket fuel called Aerozine 50. It is still used in spacecraft and rockets because it is a highly stable fuel with a low freezing point. Aerozine 50 is used in conjunction with a chemical compound called dinitrogen tetroxide, an oxidiser. The Aerozine 50 ignites upon contact with it. Initial designs had three legs, which could have resulted in a toppling Lander if one was damaged. Five legs were preferred, but they made the Lander too heavy. Four was an acceptable compromise. The first man on the moon and commander of the Apollo mission. This was his second, and last, space flight. Collins looked after the command modules while Aldrin and Armstrong landed the Eagle on the moon. The pilot of the Eagle was the second man to ever set to set foot on the moon, following mission commander Neil Armstrong. Discover more amazing space tech in the latest issue of How It Works magazine. It’s available from all good retailers, or you can order it online from the ImagineShop. If you have a tablet or smartphone, you can also download the digital version onto your iOS or Android device. To make sure you never miss an issue of How It Works magazine, make sure you subscribe today! Are Buzz Aldrin’s footprints still on the Moon?